Any site can provide you with the latest details on Paris Hilton or tell you how to beautify your workspace by adding a plant, but at Self.ca, we believe that Canadian women are seeking a more intelligent, fun and interactive online community to learn about the issues that concern us. 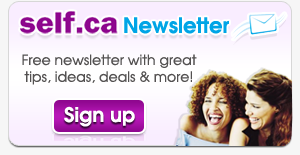 Self.ca is a site for Canadian women who want to broaden there horizons and meet like-minded women. We believe in challenging women, in bringing new ideas to the foreground and in providing higher caliber information for our members. Self.ca is filled with rich and diverse ideas; as rich and diverse as the women frequenting it. Self.ca is brimming with content about all facets of life as a Canadian woman, including unique sections such as "Fix it Yourself: a woman's guide to typically male chores", "Ecowoman: a section for the environmentally aware and our Book Club which features reviews and comments on a wide variety of modern literature. Other features such as our Quote of the Day and Canadian Woman of the Month ensure that every trip to Self.ca will help us learn more about each other and help provide upcoming generations with a wide variety of powerful female Canadian mentors. At Self.ca, we also believe in giving our readers a voice so if you enjoy writing, Self.ca encourages our readers to submit articles on any topic you deem worthy. Our editor will select the best submissions and post them on the site, with full credit given to the author. Self.ca is dedicated to all the fabulous Women that make our lives possible, to our mothers, our daughters, our aunts, wives and grandmothers, our sisters and friends, and we hope that we can provide you with a site that you value. We hope you enjoy your time at Self.ca and please don't hesitate to contact us with any comments or feedback.